Can the Cavaliers surprise the Warriors or will Golden State claim its third title in the last four years? We almost got a new matchup in The Finals, but the Boston Celtics and Houston Rockets combined to shoot 14-for-83 from 3-point range at home in their Game 7s, unable to knock off the defending champs in their respective conferences. So its the Cleveland Cavaliers and the Golden State Warriors for a fourth straight year. Kyrie Irving is gone, but we still have Stephen Curry and Kevin Durant against LeBron James and Kevin Love. The Cavs have a handful of guys who have never been here before, and it will be the Finals debut for Nick Young. Both teams needed to win on the road in Game 7 of the conference finals. The Warriors are the defending champs and the heavy favorite. The Cavs, of course, have the best player in the world, who is looking stronger than ever. But he's going to need some help. Here are some statistical notes to get you ready for The Finals, with links to let you dive in and explore more. Game 1 is Thursday at 9 p.m. ET on ABC. Conf. finals: Beat Houston in 7 games. Have outscored their opponents by 33.1 points per 100 possessions in the third quarter, the best NetRtg (by a pretty wide margin) in any quarter for any team that has played at least 10 playoff games in 22 seasons for which we have play-by-play data. They're a plus-130 in the third quarter and a plus-20 in the other three quarters combined. Second best rebounding team in the playoffs, having grabbed 52 percent of available rebounds. Lead the playoffs in aggregate bench NetRtg (plus-8.8 points per 100 possessions). The bench registered a mark of plus-16.2 per 100 in the conference finals. 41-point margin of victory in Game 3 vs. Houston was the largest for any team in this postseason and the largest in Warriors postseason history. Lineup of Stephen Curry, Klay Thompson, Andre Iguodala, Kevin Durant and Draymond Green has the best raw plus-minus in the playoffs, having outscored its opponents by 57 points in its 110 minutes. Rank second (to Philadelphia) in both ball movement (361 passes per 24 minutes of possession) and player movement (10.9 miles traveled per 24 minutes of possession) in the playoffs, according to Second Spectrum tracking. Recorded assists on just 53 percent of their field goals in the conference finals, down from 70 percent through the first two rounds. Their assist/turnover ratio of 1.90 is still the best in the playoffs. 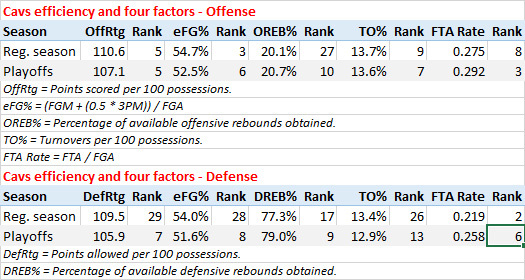 Have taken only 39 percent of their shots, the lowest rate in the postseason, in the paint. Have seen the second biggest drop in 3-point percentage from the regular season (39.1 percent, best in the league) to the playoffs (35.2 percent, 10th). Lineup of Curry, Thompson, Iguodala, Durant and Green has scored 123.9 points per 100 possessions, the best mark among 23 lineups that have played at least 50 minutes together in the playoffs. Most improved defensive team in the playoffs, having allowed 4.3 fewer points per 100 possessions than they allowed in the regular season (104.2). Most improved defensive rebounding team in the playoffs, having grabbed 80.5 percent of available defensive rebounds, up from 76.3 percent (25th in the league) in the regular season. Rank eighth in opponent field goal percentage in the paint (55.7 percent) and first in opponent effective field goal percentage from outside the paint (42.6 percent). Their opponents have shot a postseason-low 31.7 percent from 3-point range. Have allowed just 0.91 points per possession, the second lowest rate in the playoffs, in transition. Lineup of Curry, Thompson, Durant, Green and Kevon Looney has allowed 87.8 points per 100 possessions, the best mark among 23 lineups that have played at least 50 minutes together in the playoffs. Quinn Cook has shot 23 percent from 3-point range, down from 44 percent in the regular season. That is the biggest drop-off in 3-point percentage among 59 players with at least 100 3-point attempts in the regular season and at least 25 in the playoffs. Stephen Curry has taken 48 percent of his shots from 3-point range, down from 58 percent in the regular season. That is the fifth biggest drop among 84 players who took at least 300 shots in the regular season and have taken at least 50 in the playoffs. Curry has a free throw rate (FTA/FGA) of 0.156, down from 0.350 in the regular season. That is the biggest drop among players with at least 300 field goal attempts in the regular season and at least 50 in the playoffs. Curry has shot 31-for-33 (94 percent) from the free throw line, the second best mark among players with at least 25 free throw attempts in the playoffs. Curry has an effective field goal percentage of 75.9 percent and a plus-minus of plus-102 in the third quarter. In quarters 1, 2 and 4 combined, he has an effective field goal percentage of 50.3 percent and a plus-minus of minus-2. Kevin Durant has made 21 more mid-range shots than any other player and is the only player to have shot 50 percent or better on at least 40 mid-range attempts. Only 46 percent of Durant's shots have come from the restricted area (13 percent) or 3-point range (32 percent). That is the fourth lowest rate among 89 players with at least 50 field goal attempts in the playoffs. Durant has attempted twice as many pull-up 3-pointers (62) as he did in last year's postseason (31). Durant and Klay Thompson have scored 1.37 and 1.32 points per possession, respectively, in transition. Those are the two highest rates among 31 players with at least 25 transition possessions in the playoffs, according to Synergy tracking. Draymond Green has the second lowest rate (0.74 points per possession) among that same group. Green leads the postseason with 198 total rebounds and is one of three players with at least 100 rebounds and 100 assists in the playoffs. He has recorded assists on 36 percent of his possessions, the highest rate among players who have averaged at least 15 minutes in 10 or more games. Green is also the only player with at least 20 steals and 20 blocks in the playoffs. He has 58 and 33. Green and Thompson have played 600 minutes together, most among two-man combinations in the playoffs. Green has 48 assists to Thompson, the second most from one player to a single teammate in the playoffs (behind Harden to Capela - 53). Green leads the postseason in raw plus-minus, with the Warriors having outscored their opponents by 140 points with him on the floor. The Warriors have outscored their opponents by 13.6 points per 100 possessions with Andre Iguodala on the floor. That's the best on-court NetRtg among players who have averaged at least 15 minutes in 10 or more games. Shaun Livingston and Curry have shot 83 percent and 79 percent in the restricted area, respectively. Those are the second and fourth best marks among players with at least 25 restricted-area field goal attempts. Only 32 percent of Livingston's shots have come from the restricted area (31 percent) or 3-point range (one percent), the lowest rate among 89 players with at least 50 field goal attempts in the playoffs. The Warriors have allowed 96.2 points per 100 possessions with Kevon Looney on the floor. That is the lowest on-court DefRtg among players who have averaged 20 or more minutes in at least 10 games in the playoffs. Thompson has taken only 12 percent of his shots in the restricted area, the third lowest rate among 89 players with at least 50 field goal attempts in the playoffs. He has a free throw rate (FTA/FGA) of just .089, the second lowest rate among players with at least 100 field goal attempts in the playoffs. Thompson ranks second in the postseason with 0.443 points per touch (minimum 300 touches) and leads the postseason 45 catch-and-shoot 3-pointers. He has shot 60 percent on wide-open threes, the best mark among players who have attempted at least 20. He ranks second in the postseason with 20 corner threes, with 11 of them having come in the conference finals. His nine 3-pointers in Game 6 vs. Houston are the most made in a game this postseason. Thompson has traveled 47.6 miles, second most in the postseason. First round: Beat Indiana in 7 games. Conf. semis: Beat Toronto in 4 games. Conf. finals: Beat Boston in 7 games. Per-game point differential (including regular season) of plus-1.0 points per game is the worst mark among teams to reach The Finals since 1981, when the Rockets reached The Finals with a point differential of plus-0.8 points per game through the conference finals. Have seven wins (most in the playoffs) in games that were within five points in the last five minutes. Have been on either end of three of the four biggest point differentials in the playoffs, beating the Raptors by 35 in Game 4 of the conference semis, losing to Indiana by 34 in Game 6 of the first round, and beating Boston by 30 in Game 3 of the conference finals. Lineup of George Hill, J.R. Smith, LeBron James, Jeff Green and Tristan Thompson has outscored its opponents by 25.7 points per 100 possessions, the second best mark among 23 lineups that have played at least 50 minutes together in the playoffs. Rank 15th (ahead of only Houston) in both ball movement (273 passes per 24 minutes of possession) and player movement (9.4 miles traveled per 24 minutes of possession) in the playoffs, according to Second Spectrum tracking. Have the postseason's No. 1 first-half offense (111.6 points scored per 100 possessions) and its 15th-ranked second-half offense (102.9). 24 percent of their shots, the highest rate in the playoffs, have come in the last six seconds of the shot clock, according to Second Spectrum tracking. Have had two of the best three shooting games (effective field goal percentage) in the playoffs, both in the Toronto series. Have scored just 14.8 points per game in transition, the second lowest rate in the playoffs. See more play type data from the Warriors and Cavs in the NBA.com/stats preview. Have allowed 3.6 fewer points per 100 possessions than they did in the regular season (109.5). Only the Warriors have seen a bigger defensive improvement. Rank last in the playoffs with just 11.6 deflections per game. Have allowed just 0.79 points per possession on isolations, tied for the lowest rate in the playoffs. Opponents have shot a postseason-low 23 percent, including 2-for-21 from 3-point range, on clutch shots. Jordan Clarkson's effective field goal percentage of 35.9 percent is the worst mark among 89 players with at least 50 field goal attempts in the playoffs and is down from 51 percent in the regular season. That's the biggest effective field goal percentage drop among 84 players who took at least 300 shots in the regular season and have taken at least 50 in the playoffs. Kevin Love (from 55 percent to 45 percent) has seen the fifth biggest effective field goal percentage drop among that same group of players. Clarkson has a free throw rate (FTA/FGA) of just .055, the lowest rate among players with at least 100 field goal attempts in the playoffs. Jeff Green has taken 49 percent of his shots from 3-point range, up from 28 percent in the regular season. That is the biggest jump in 3PA/FGA among 84 players who took at least 300 shots in the regular season and have taken at least 50 in the playoffs. George Hill has a free throw rate (FTA/FGA) of 0.470, the highest mark among players with at least 100 field goal attempts in the playoffs and up from 0.273 in the regular season. Hill has shot 26 percent from 3-point range, down from 41 percent in the regular season. That is the second biggest drop-off in 3-point percentage among 59 players with at least 100 3-point attempts in the regular season and at least 25 in the playoffs. Rodney Hood has taken 29 percent of his shots from 3-point range, down from 44 percent in the regular season. That is the biggest drop among 84 players who took at least 300 shots in the regular season and have taken at least 50 in the playoffs. The Cavs have been outscored by 19.5 points per 100 possessions with Hood on the floor. That's the worst on-court NetRtg (by a wide margin) players who have averaged at least 15 minutes in 10 or more games. LeBron James leads the playoffs points per game(34.0), free throw attempts per game (9.7), double-doubles (13), triple-doubles (3), secondary assists per game (1.3), points per game scored on drives (12.1), and points scored in the clutch (35). James ranks third in the playoffs at 8.8 assists per game and is one of five players responsible for more than half of their team's assists while they've been on the floor. He has 70 assists on 3-pointers, 22 more than any other player. James has seven of the 11 highest scoring games of these playoffs. He's been assisted on just 21 percent of his field goals, his lowest rate for any postseason. He's made 37 shots in the last four seconds of the shot clock, more than twice as many as any other player in the playoffs. James has scored 54 more points in the restricted area than any other player in the postseason. He also made more 3-pointers in the conference finals (he shot 18-for-44) than he made in the first two rounds combined (15-for-52). James has traveled 45.8 miles, third most in the postseason, though his average speed of just 3.71 miles per hour ranks last among 69 players who have played at least 200 minutes. The Cavs are a plus-71 in 400 minutes with James and Hill on the floor together. They're a minus-33 in 343 minutes with James on the floor without Hill. Kyle Korver leads the postseason with 0.455 points per touch (minimum 300 touches) and has an effective field goal percentage of 64.0 percent, the eighth best mark among 89 players with at least 50 field goal attempts in the playoffs (and best among those still playing). He has taken 78 percent of his shots from 3-point range, the highest rate among that same group of 89 players. Kevin Love has grabbed 32 percent of available defensive rebounds while he's been on the floor, the second highest defensive rebounding percentage among players who have averaged at least 15 minutes in 10 or more games. Love is one of three players who have shot 90 percent or better on at least 35 free throws in the playoffs. Larry Nance Jr. has shot 27-for-30 (90 percent) in the restricted area, the best mark among players with at least 25 restricted-area field goal attempts. J.R. Smith has shot 15-for-27 (56 percent) on corner 3-pointers, the best mark among players who have attempted at least 20 in the playoffs. Korver and Smith have taken only six percent and 18 percent of their shots in the paint, respectively. Those are the two lowest rates among 89 players with at least 50 total field goal attempts in the playoffs. Tristan Thompson has grabbed 13 percent of available offensive rebounds while he's been on the floor, the second highest offensive rebounding percentage among players who have averaged at least 15 minutes in 10 or more games. Both games took place before the Cavs overhauled their roster at the trade deadline. They played only one minute vs. the Warriors with five players that are still on the roster. Stephen Curry missed the Christmas game. The Warriors' lineup of Curry, Thompson, Iguodala, Durant and Green played just four minutes in the January game. The Cavs were a plus-5 in the first half of the two games and the Warriors were a plus-22 in the second half. The Cavs grabbed 30.1 percent of available offensive rebounds, their best mark against any opponent, though the Warriors outscored them, 29-25, on second chance points. Tristan Thompson had seven offensive rebounds in just 27 total minutes over the two games. The Warriors outscored the Cavs, 53-21, on fast break points (including 33-9 in the Christmas game). Kevin Durant and Klay Thompson combined for 28 fast break points between them. The Cavs' effective field goal percentage of 45.1 percent was their second worst mark against any opponent. They shot just 8-for-33 (24 percent) from mid-range. LeBron James shot 14-for-16 in the restricted area and 5-for-20 from outside the restricted area. His 7.5 turnovers per game were the most he averaged against any opponent this season. The Christmas game was Draymond Green's first of three triple-doubles in the regular season. Kevin Love's 18 rebounds in the Christmas game were tied for the most against the Warriors this season. In the game that Curry played, Isaiah Thomas was his primary defender. The Warriors scored 45 points on those 32 possessions (1.41 points per possession). Jae Crowder was Durant's primary defender. Kevin Durant was the primary defender on James (77 of 157 possessions). On those possessions, James shot less often than he usually does and the Cavs scored less efficiently than they did on average. Only one of the five games (Game 3) was within five points in the last five minutes. The Cavs shot 1-for-9 on clutch shots and Kevin Durant hit the go-ahead 3-pointer. 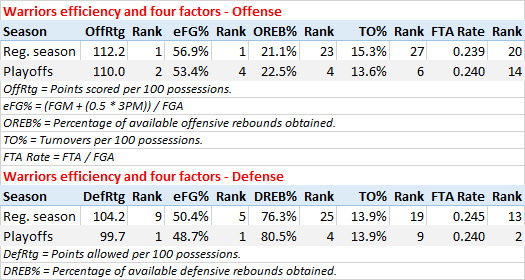 The two teams combined to score almost 115 points per 100 possessions over the five games and almost 125 points per 100 possessions in Games 4 and 5 combined. The Warriors four turnovers in Game 1 were the fewest they've committed in franchise history (regular season or playoffs). The 24 3-pointers the Cavs made in Game 4 were a Finals record and one shy of their playoff record (set the season before). Both teams started the same lineups (Zaza Pachulia and Tristan Thompson at center) in all five games and both starting lineups scored 131 points in the 49 minutes in which both were on the floor. The Warriors' lineup of Curry, Thompson, Iguodala, Durant and Green outscored the Cavs by 26 points in just 33 minutes together. All other Golden State lineups were a plus-8 in 207 minutes. The Warriors outscored the Cavs by 60 points in 141 minutes with Iguodala on the floor and were outscored by 26 points in 99 minutes with him off the floor. LeBron James and Stephen Curry each had triple-doubles in Game 2 (the only triple-double of Curry's postseason career). James added another in Game 4. Deron Williams (2-for-16) and Iman Shumpert (4-for-17) combined to shoot 18 percent. James scored 84 points in the restricted area, 34 more than any other player in the series. For notes on the 2016 Finals, see last year's preview. For notes on the 2015 Finals, see the 2015 preview.